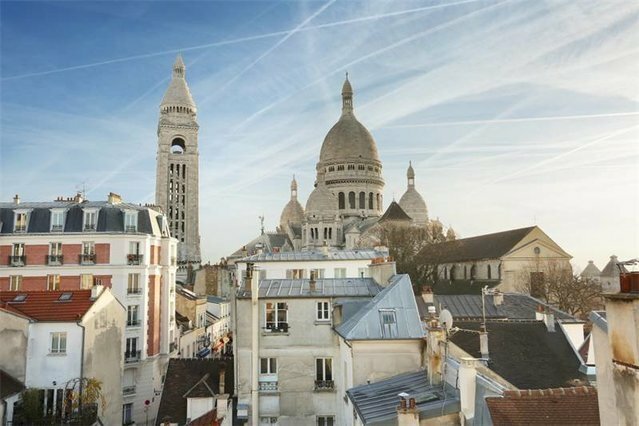 This late 20th century private mansion is in a delightful pedestrian street located in the immediate vicinity of Sacré Coeur Basilica and internationally renowned Place du Tertre. It includes a living/reception room opening onto a landscaped garden, a bedroom and a bathroom, with two further bedrooms and a bathroom upstairs. The second floor comprises a kitchen and a dining room opening onto a little terrace enjoying exceptional views over the capital and of the Basilica. Two further bedrooms and a bathroom opening onto a terrace are on the top floor. The basement features a swimming pool and a sauna, as well as a laundry room. This exceptional property is hidden from view yet enjoys stunning panoramic views.